Caner’s Rum Quality Inverse Square Conjecture: quality of rum is inversely proportional to the square of the sum of [ glitziness of website plus design of the label ]. The presentation and advertising and marketing of this rum is all about fancy bottle and label design, gorgeous visuals, and words to make you giddy with anticipation. It nails all aspects of those. Everything else is secondary, except the rum itself, which is tertiary. Just to set the stage: I honestly thought my amigo Henrik, in his savage takedown of the rum, was exaggerating his despite. However, intrigued, I begged him for samples to save me buying them, and he was prepared to gift me the whole bottle except that his luggage was already full of stuff he was bringing to Berlin (for me). 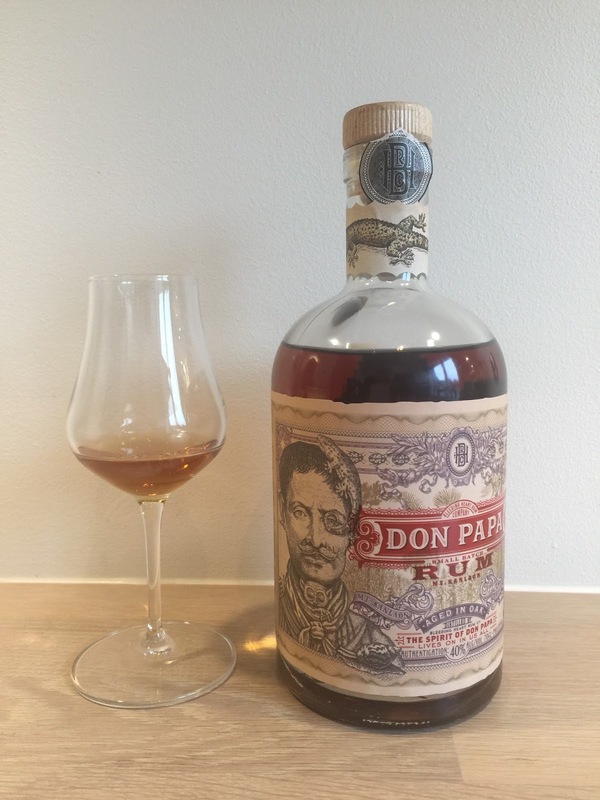 And just to see if its claim to being a “premium aged small batch rum” held up, I tried the Don Papa 7 year old (and its brother the ten year old) four times: once with a flight of eight Jamaicans, then with a flight of seven Demeraras, a third time with a raft of agricoles and then with yet another one of nine Bajans. Lord Almighty, this thing was annoying. I don’t think I’ve been this irritated with a rum since the Pyrat’s 1623. It’s appalling lack of profile compared to the comparators is only matched by its self evident desire to emulate a soda pop. When I think of the elegant construction of something like the FourSquare 2006 and its years of development, I want to rend my robes, gnash my teeth and weep bitter tears of despair for the future of the rumiverse. It may be the bees knees in the Phillipines, where different rules for rum production are in force and different palates and tastes rule – but maybe it should stay there and not afflict real rums. Think I’m being unjust? Unseemly vicious? That I jest? Not at all. The 40%, American-oak-aged amber rum reeked — that’s the only word I can come up with that describes the cloying, thick aroma of yoghurt emanating from the glass, a sort of sour cream and curds kind of smell, leavened with some raspberries and cherries. It makes the A.H. Riise Navy Rum seem like a masterpiece of blending assembly. And then there was the overdone saccharine citrus smell of fanta, bubble gum, vanilla (gobs of that), and sprite and cream soda…what the hell, maybe they tossed some coke in there too. Rum? I dunno – it smelled like a mixing agent to which one adds rum. And it was on the palate that its true adulterated nature became fully apparent. The mouthfeel is where it started – it literally felt like a soda, complete with the slight scrape of what could charitably be called bite but which I’ll call chamberpot-brewed rubbing alcohol. Again that yoghurt taste was there, this time without the creaminess, the raspberries being replaced by a peach or two…and the vanilla and sprite and coke were still there in abundance, finishing the job of ruining what had been an unremarkable, unprepossessing liquid that wasted too much of my time. There was no finish to speak of, which was unsurprising, given how dosed and choked up this thing is with so much that isn’t rum. Even Pyrat’s XO would probably shudder at what the company did here (while taking notes). This is the kind of rum which drives reviewers into transports of rage, because it gives all rum a bad name, and frankly, with all due respect to the nation of origin which makes the much better Tanduay 12 year old, it’s barely a rum at all. And yet it sells briskly, calmly splashing around in the great urinal of low-to-mid-level adulterated rum sales, which just goes to show that spice and sugar will always move product. What most of those don’t do is slap lipstick on a pig with quite the abandon and disdain for quality this one does. It truly has to be drunk to be believed, and trust me, unless you love your dentist, that’s not something I would recommend. I might have been less snarky if they had simply labelled it as a spiced rum (which it is) instead of some kind of aged artisinal product (which it isn’t). Cyril at DuRhum had this run through a lab test and that evaluated it with 29g/L sugar, 2.4 g/L glycerol and a massive 359 mg/L of vanilla. Who makes this? Well, the Bleeding Heart Rum Company, to be exact, and this link will answer most other questions about the product. BHRC is in turn a subsidiary of Kanlaon Limited a small single-director, 100-share company registered in a business village in Middlesex, listing Mr. Stephen Carroll as the man in charge, and he apparently worked for Remy Cointreau for some years before striking out on his own (he has other directorships in companies involved in film and video production). Since I don’t trust much of anything the website says, I won’t rehash its blurbs here. In light of all the love for Don Papa I would re-visit Ron Millonario XO. I think your score of 88 would have to change considerably as it is about as rummy as Don Papa. If not worse. I don’t change historical scores. For good or ill, past scores stay as they are, even if they reflect a taste and a profile I’ve stopped appreciating, or, conversely, appreciate now more than formerly. That was the way I felt at the time based on my preferences at that time. Still, you have a point: 88 is probably too high for the Millonario. But I argue that there is no comparison between these two rums. Don Papa is an over spiced mess. There’s a lot more going on under the hood of the Millonario than most acknowledge, being unable to get past the sweet. I tried it again in 2015 and still think it’s not bad, and I’ve told Fabio on more than one occasion to dial it down – it would still be a good rum.